It is very likely that you will be able to synchronize your calendar with other calendar providers by using Google Calendar as a glue in between them. We cannot guarantee it will work 100% but several users have reported to at least manage to sync their accounts with iCal by using Google in between. Below is an illustration of the concept. If you have a Gmail account, or any other Google account (for Youtube, Google+, etc) then you will automatically have a Google Calendar account as well – even if you've never used it before. 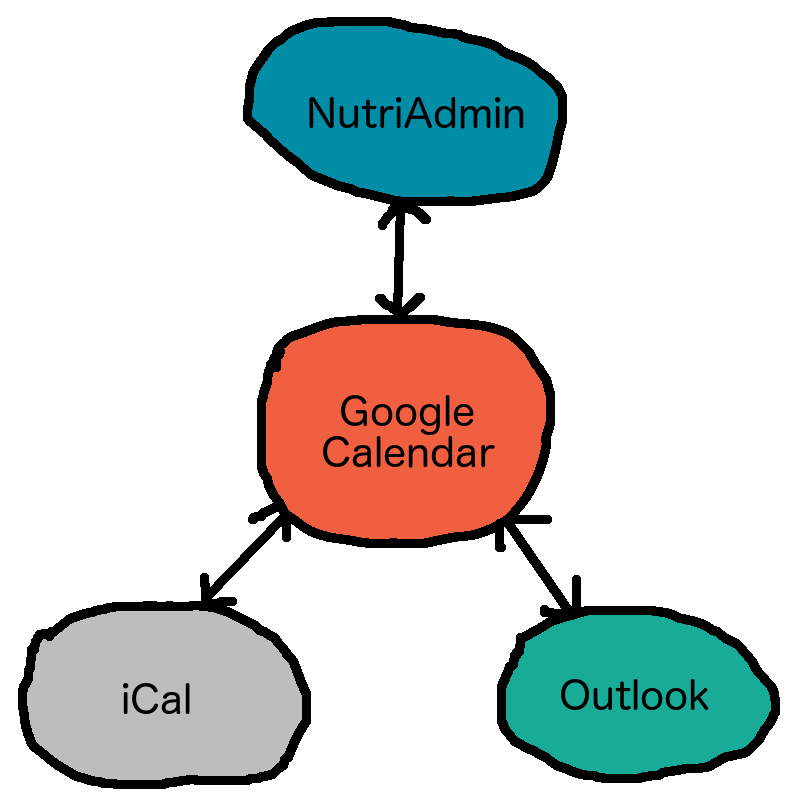 It is possible to link NutriAdmin with iCal or Outlook Calendars using Google in the middle, without having to ever login to Google Calendar. So you don't have to change your habits, or learn about new software. Google Calendar is free, private, and is stored in the cloud. You can access it from any device with an internet connection, either from a browser, or from an app. You can use Google Calendar if you like it, but it's not even necessary. You could basically configure it to link to all your accounts – effectively duck-taping them together, and then, you don't have to ever touch Google Calendar again if you don't like it. If you connect all accounts, then they would all be synchronized and sharing calendar events automatically. You could use different apps for different purposes, separate professional/personal events, etc. All possibilities are available, and it shouldn't be hard to set them up. If you like the idea, there are just a few simple steps you need to take. You can do them in 20-30 min; and once you do them, you don't need to fiddle with this kind of configuration again. If any of the above links doesn't explain the process well, or the app you want to link is not listed, you can always google how to synchronize Google Calendar with X.